The wrack wall and how storms can tear seaweed from their rocks. In the last posts, Lena has been reporting on all the interesting finds you can make on the beach after a storm. However, these haven’t been all that much about the different species of seaweed that gets washed ashore during strong winds. So, here is a small exposé of what she found after the storm Sven (Bodil in Denmark, Xaver in Germany). 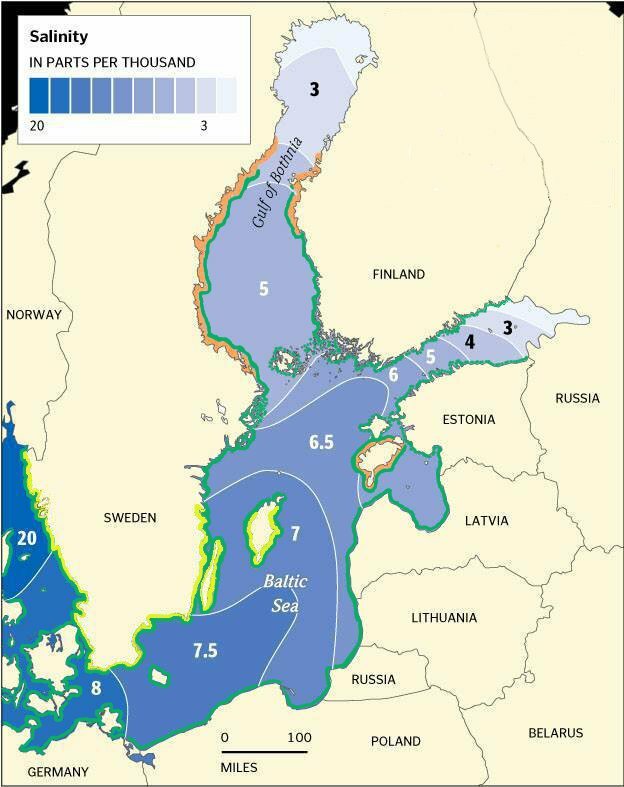 In some bays on the west coast at Tjärnö, seaweed forms large beach walls whereas in other bays you will only find a few specimens of what is growing just a couple of meters off shore. 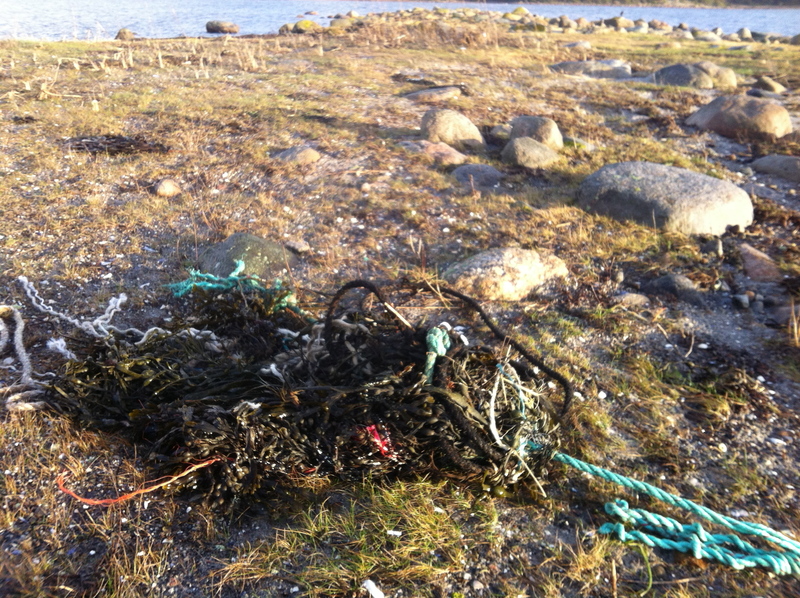 Seaweed can also come entangled in ropes and lines from far away. A photo from a bay filled with seaweed forming thick carpets. Later in the year, in the summertime, they will have been decomposed and form a beach wall covered in lush green plants. Seaweed and algae make excellent compost due and was formerly gathered to fertilize the potato patches. 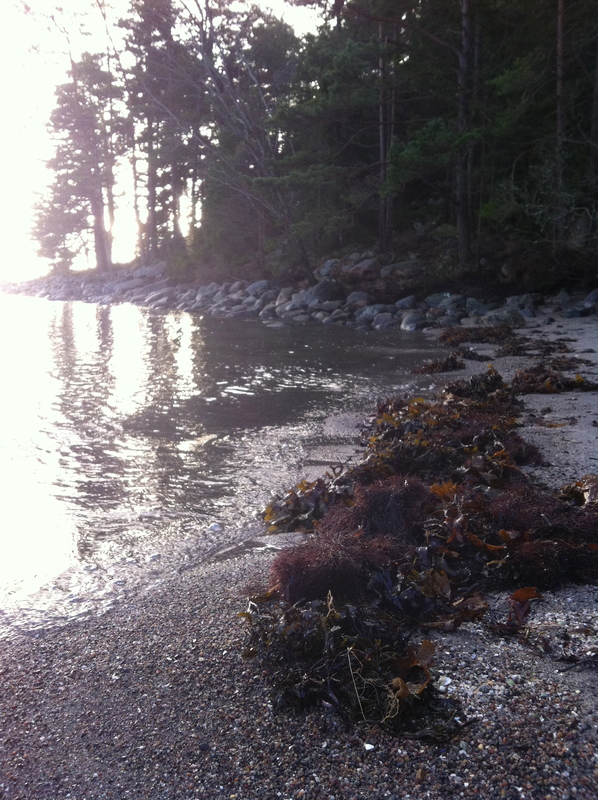 If you find a bay full of seaweed you can collect some and put in your garden. On other shores, like in this photo, there is only some seaweed and the red alga Furcellaria lumbricalis in a band just by the water. This is the popular sandy beach at Saltö. Higher up on the shore some distance away, i found a pile of rope and entangled algae. On closer examination, it turned out to be seaweed from quite some distance, maybe as far away as England. How can you tell that the seaweed is from far away and not just from next bay or further down the coast? If you look closely at the photo underneath, you’ll see some long, brown slightly knobbly bands, which are the reproductive organs (receptacles) of Himentalia elongata, which has never been found attached in Swedish waters. The nearest site is in Norway. In the pile there is also very large bladders of Ascophyllum nodosum and a form of bladderwrack (Fucus vesiculosus)with several bladders that is much more common in areas of higher salinity that at the Swedish coast. Those of you who look closely on the photograph will notice a red algae on the bottom right, like small, finely branched bushes attached to the Ascophyllum nodosum. This is one of many Polysiphonia species, and this particular species is commonly found growing on Ascophyllum nodosum and it is called Polysiphonia lanosa. The wrack wall consists, as one might guess, mostly of wracks that have been washed ashore, both bladderwrack and serrated wrack (Fucus serratus). The smaller specimens were still attached to blue mussels (Mytilus edulis)and others had not attached hard enough to rock or boulder and had come loose. 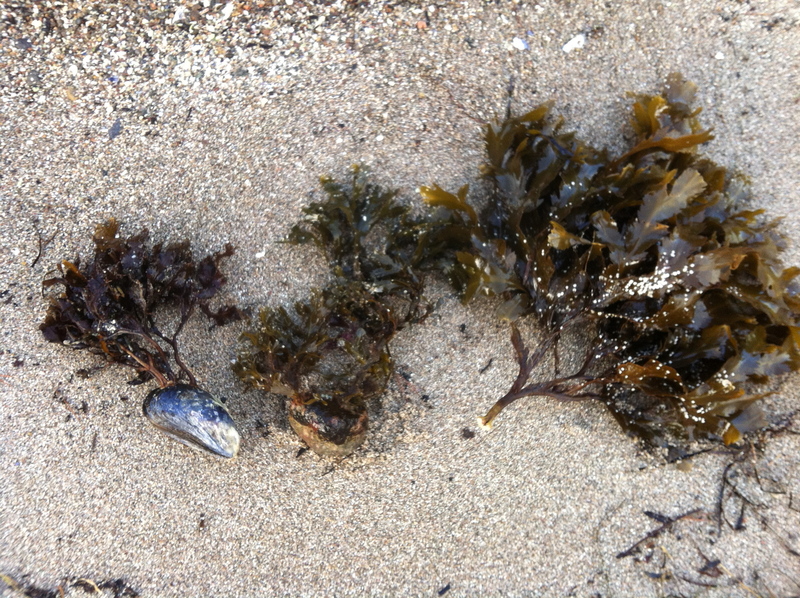 Different sizes of wrack washed ashore, with accessories. Slightly larger specimens were washed ashore still attached to pebbles. A larger plant of seaweed is very firmly attached to the rock surface and you can lift the rock by holding the seaweed sometimes. It’s not until the wracks get really big that the pull of the wave manages to tear them loose from the rock or boulder to which they are attached. But, if you look closely on the bottom of the holdfast, there is a white calcareous layer. The wrack that has come loose with holdfast has once settled as a small germling on a crustose calcareous algae or a barnacle. So what has actually come loose by the wave force is not the seaweed holdfast, but the barnacle or calcareous alga that can no longer hold on to the rock surface. 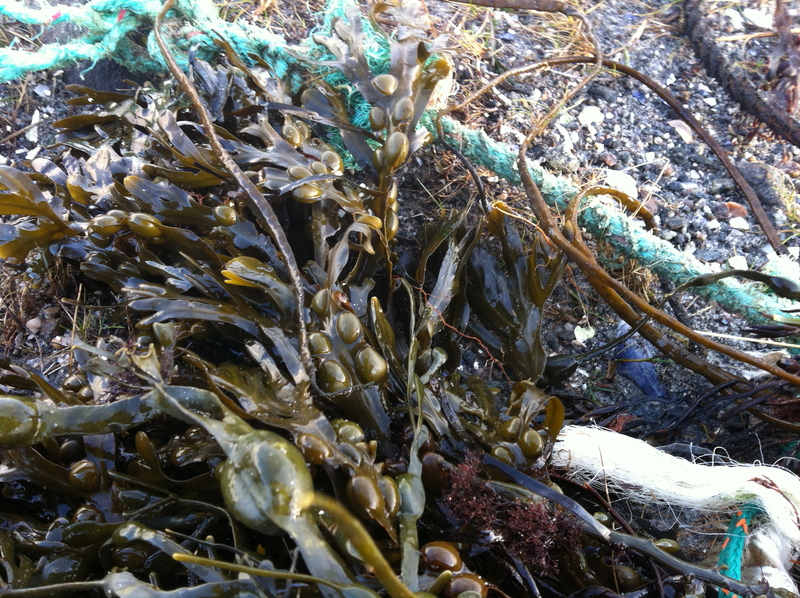 The photo shows a holdfast from a Fucus serratus with clearly visible white parts of a calcareous crustose alga. 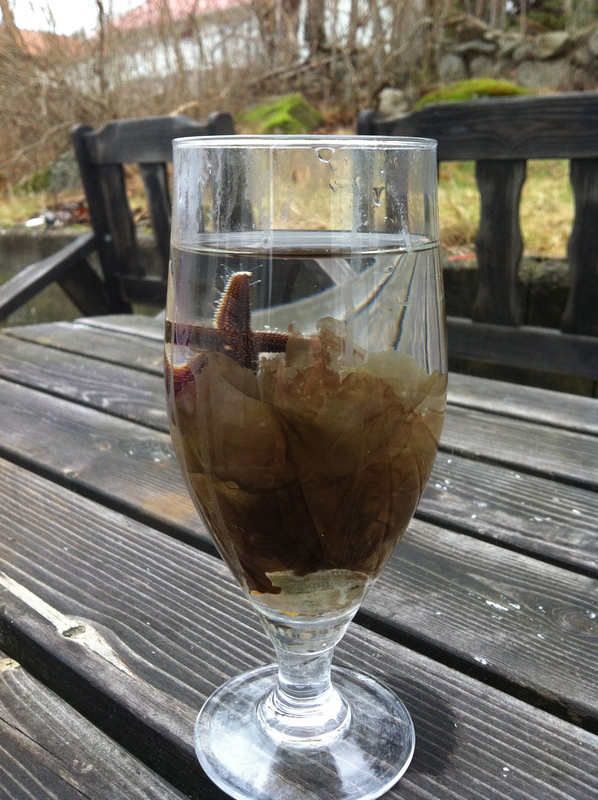 And finally – a somewhat late toast for the new year and wishing you all a happy 2014 from the BalticSeaWeed blog. Here in Sweden, the frost is making everything sparkling white, and our noses and cheeks red. So what could make us warmer than some Cinema Seaweed? During summer and autumn, several seaweed movies have appeared on YouTube. This is a trend that we hope will last. Here are links to nice seaweed movies that we have come across. Nyköpings municipality, just south of Stockholm, has really got the hang of how to show itself from its best side! Here you can see the two localities Långskär and West Kovik. The gurgling sound you hear is when the snorkel is filled with water. From Skälderviken down south in Skåne county we can see that both bladderwrack and serrated wrack have recovered. 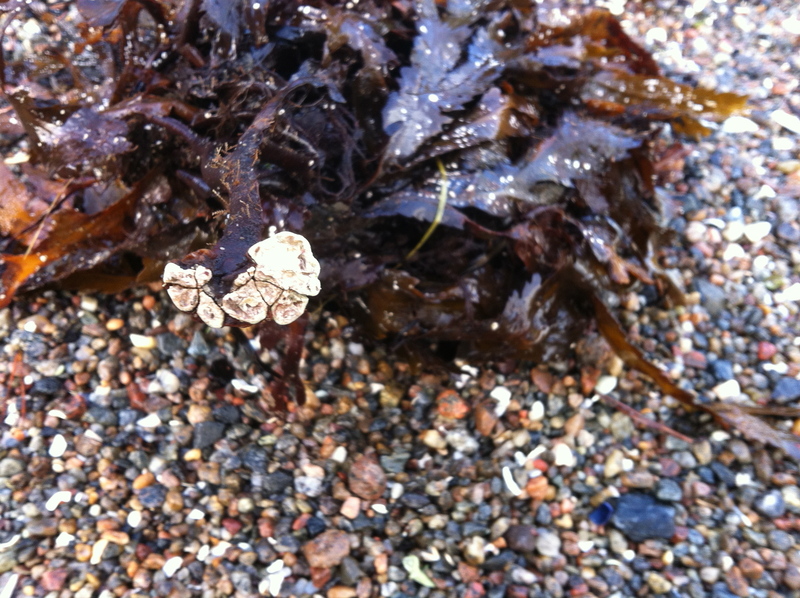 It is also shown that 2013 was an incredibly successful year for the brown algae Dead Man’s Rope (Chorda filum) along most of the Swedish coast. The movie is by Virtuerack. Virtue is a resource for schools, created by the Faculty of Science at Gothenburg University and The Maritime Museum & Aquarium in Gothenburg. They also have more movies where they show how cd-discs are being placed under a jetty in the sea and become habitat for several algae and animals. Do you have any nice seaweed movies? Please let us know.